Environment Minister Richard Benyon has announced that five species of invasive non-native aquatic plants are to be banned from sale, In the first ban of its kind, the government hopes the ban will save the environment agency money and at the same time help to protect vulnerable habitats. The plants that will be banned from April next year are water fern, parrot's feather, floating pennywort, water primrose and Australian swamp stonecrop. Richard Benyon said that "tough laws to curb the sale of these plants could save the country millions of pounds as well as protecting wildlife such as fish and native plants, but as well as saving money and protecting wildlife the ban will also help maintain access to rivers and lakes for anglers and watersport fans." Announcing the ban, Defra explained that the plants that have been banned had previously been sold by garden and aquatic centres and planted in garden ponds but have escaped into the wild, where they have overwhelmed our native species as they have no natural predators to eat them. Consequently the plants were able to take over by creating large unpenetrable mats of foliage, depleting oxygen and light availability, causing declines in the numbers of fish and other aquatic species. 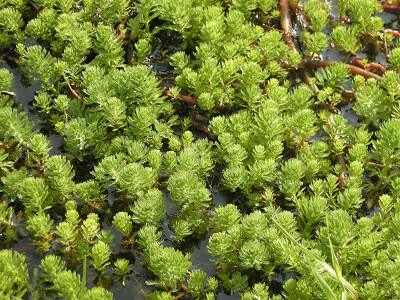 As they clog up watercourse alien plants can also lead to an increased risk of flooding. It's good to see action being taken. We have quite the ongoing battle with English ivy and Scotch broom. Once they get ahead of us, they are really difficult to eradicate.